This time we have a closer look at the bottlers of our precious single malts. In particular we want to compare independent bottlings and those which were originally bottled by the distillery itself. Does the bottler affect the secondary whisky market prices? Distilling the whisky is for sure a very important part of the whisky making process and defines a lot of the characteristics we like and may dislike. Giving the spirit the right place and time for maturing is another. While bottling the whisky is the last part of the production chain, the importance of this last step is not to be underestimated. It is not so much the technical process of putting the liquid in the bottle, it is much more the selection of the right barrels, the decision over filtration and colouring and last but not least the marketing that will influence the prices which we are willing to pay. In a nutshell, whisky is either bottled by the distillery itself or by independent companies. Those independent bottlers either buy the new make spirit and put it in barrels themeselfes or they buy and trade already matured whisky in the barrel. They either store those barrels on their own or leave them at the distillery or any other shared storage facility. We now want to find out if the secondary whisky market knows any difference in the prices of original distillery bottlings (OBs) and those issued by those independent companies, i.e. independent bottlings (IBs). Out of the 17.490 whiskies currently (June 2016) in our whisky database, 7.400 are original bottlings and 10.090 are independent bottlings. On the other side, out of the 203.042 price observations, 150.544 belong to the original and 52.496 to the independent bottlings. So almost three-quarters of all trades we ever observed belong to original distillery bottlings. As these figures include all our price observations which date back to November 2005, we now want to restrict our attention to the latest auction results. For the purpose of getting a more up-to-date impression of the market we now only consider those whiskies for which we have at least one price observation since January 2015. This is true for 5.570 OBs and 5.401 IBs with corresponding 46.388 and 11.661 price observations, respectively. We now want to compare the actual prices. We see some interesting patterns. While the prices for the cheaper half of whiskies are higher for independent bottlings, there seem to be far more super expensive original bottlings. This can be also seen if we compare the median and the average prices. While the median is higher for IBs, the average price for OBs is as high as 425 Euros due to some exceptional expensive whiskies. To prove this point, we group the whiskies into price buckets and see how many of the OBs and IBs fall within the respective buckets. 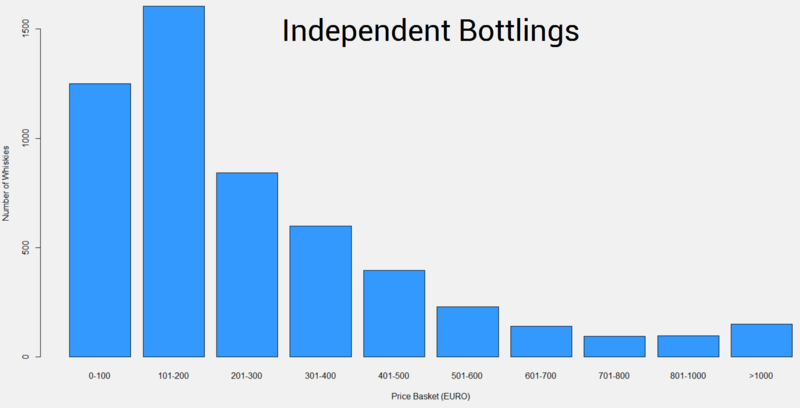 For the independent bottlings we see that around 1.700 are worth between 100 and 200 Euros, which is far more than there are in the cheapest bucket of those whiskies worth less than 100 Euros. We also see that there are only around 200 IBs which latest auction prices are above the 1.000 Euro threshold. The strongest OB price bucket is the cheapest one with almost 1.800 whiskies. In contrast to the IBs we see far less OBs worth between 200 to 500 Euros. We also see our observation from above confirmed that there are a lot of very expensive original bottlings. In fact, there are more than 500 original bottling single malts worth more than 1.000 Euros. As always we are also interested in how those prices evolved over time. 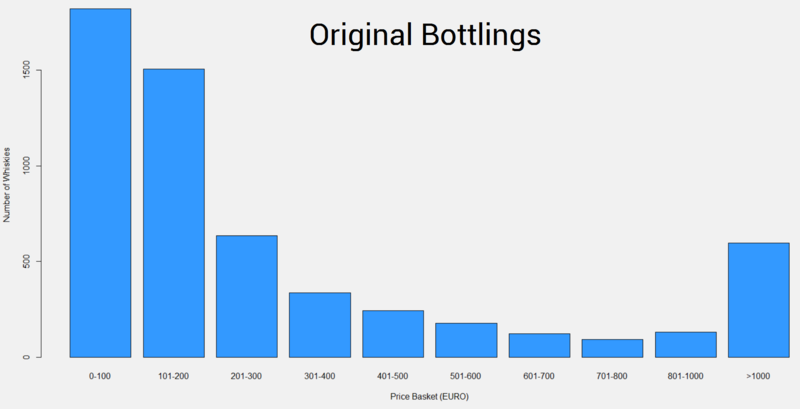 So we simply compare the price evolution of the 300 most traded original bottlings and the 300 most traded independent bottlings. The below indices consist of 42.082 (OB) and 7.862 (IB) price observations. The first thing we observe is that the OB index pretty much equals our whiskystats whisky index which consists of the overall 300 most traded whiskies. This is not to much of a surprise since we have already seen that original bottlings are far more often traded than their independet counterparts. Next thing we notice is that while the IB index is below the OB index, over the past 18 months it climbed faster. Since January 2015, the 300 most traded original bottlings gained 17,4% in value and the 300 most traded independent bottlings gained 19,3% in value. Another interesting fact is that the IB index curve is much smoother than the OB one, i.e. the prices for independent bottlings do not vary that much as those of original bottlings. In the above IB index we didn’t differ between the independent bottlers. We now want to do so and hence simply compare the above OB index with some of our bottler indices. Thereby, we restrict our attention to the four major independent bottlers (out of 197) according to their market share that can be found in our database overview. These are Gordon & MacPhail, Signatory Vintage Scotch Whisky, Cadenhead and Douglas Laing. We see that the 100 whiskies included in the Douglas Laing and Signatory Vintage index do not need to shy away from a comparison with the original bottlings. The Douglas Laing index even outperforms the original bottlings while retaining the smoothness we see for all IB indices. Same holds for Gordon & MacPhail. The only index that stayed below 200 was Cadenhead, which simply means that those 100 whiskies did not doubled in value since we started tracking their prices. In a last step we want to figure out if there are regional differences. So what we do is comparing the price evolution of a region´s 100 most traded original bottlings with those of the independent ones. We do this for the three major single malt whisky regions which are Speyside, the Highlands and Islay. For Speyside we see quite the same pattern as above for the overall indices. The IB index is below the OB index but far smoother and has about the same increase over the past 18 months. For the Highlands we see that OBs and IBs were very close together until January 2015. Since then, original highland bottlings gained far more value than the independent bottlings from this region. The Islay comparison pretty much reflects our overall observations. A much smoother price evolution for IBs which even outperformed the OB price increase over the past 18 months. It seems like measured by quantity, the secondary whisky market is dominated by original bottlings. Then, most of those original bottlings are cheap by comparison (less than 200 Euros), while there are more independent bottlings worth something between 200 and 500 Euros. While OBs are much more traded, in terms of price development IBs equally or over the past 18 months even gained more value than OBs. Single independent bottlers, like Douglas Laing and Signatory Vintage, even outperform original bottlings in terms of price evolution. The latest round of auctions saw our database reach some new milestones. The Macallan Boutique Collection 2016 is by far the most traded whisky of this month. Meanwhile Bunnahabhain bottlings continue to gain value! It is time to bring us all on the same page about the current state of the secondary whisky market. While the market as a whole continues to grow and prosper, we observed some significant changes in its composition over the last couple of months. Before we analyse our data in detail, it is worthwhile getting a rough overview about what we are dealing with. 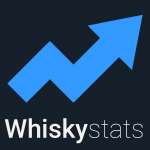 This provides a first glimpse at our Whiskystats Database. This topic contains 0 replies, has 1 voice, and was last updated by Whiskystats 2 years, 10 months ago.